No denying Kilmarnock, Motherwell, Hibs and Dundee did Rangers a huge favour today. After the side dropped another two points in a dreadful display last night, various other outfits’ results in Scotland’s top flight this afternoon helped the Ibrox men out and not only stopped us falling down the table, but in fact strengthened our position thanks to the point ‘gained’. But it does not alter the disappointment of struggling to even clinch a point at Firhill against 10 men – taking a stunning effort from Graham Dorrans to secure even that. Six matches into the SPL campaign and while Rangers are two points better off than they were this time last season, we cannot help feeling the season is going in much the same direction. There is that nagging feeling that despite the favourable formation and the apparently improved personnel, Rangers are in exactly the same spot they were 12 months ago. For every sense of modest progress, like two wins on the trot (against admittedly poor opposition), there follows a crucifying setback such as last night. For every ounce of joy we get from yet another fine goal from the on-fire Alfredo Morelos, there is the despair as another shambolic concession is made by our defence. This is not to call Pedro Caixinha a failure and the squad inept – albeit we admit we have been castigating of the Portuguese in the past; the brutal truth is the whole thing from board, to management, to player simply feels very ‘meh’. It is not consistent, it is not impressive, and while it shows signs of life now and then, inevitably it stutters horribly again thereafter and fans find themselves suffering yet again. The overriding comments the site articles have received this weekend have been ‘thanks for another awful weekend Rangers’. After the slight hope gained from beating County and Dundee, it all comes thumping back down to earth when we cannot even put away Partick Thistle, the bottom team. Whether those two results papered over cracks we cannot know for sure; there are certainly some positives, from Morelos’ scintillating form, to Candeias’ impressive shows and attitude out there, to Tavernier’s distinctly improved form this season while the two central Scots Dorrans and Jack certainly huff and puff and try to keep Rangers in it. But right now Rangers have 11 points from a possible 18 and while the old ‘give it time’ and ‘let it gel’ brigade are probably out in numbers, it all really feels like déjà-vu for yours truly. New manager. New coaches. New staff. New players. Same old Rangers. 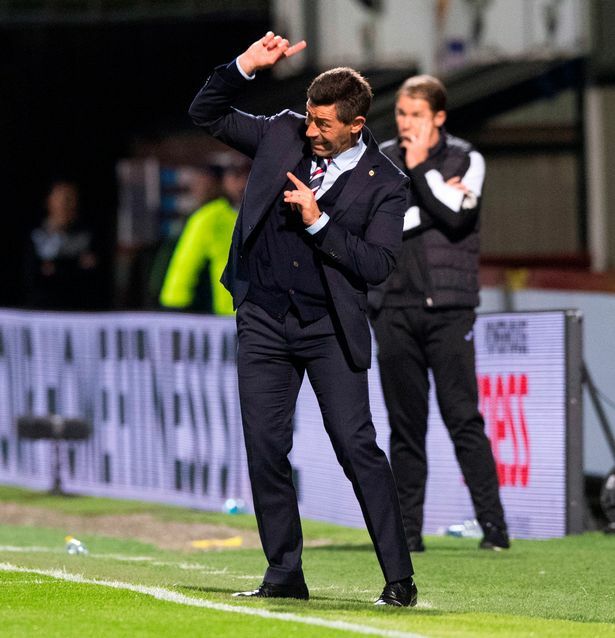 While we do not want to be glaringly negative in this article, and we do want to be as positive as we can, constructively, of course, the fact Rangers had to rely on outside results to cling onto third place tonight only six matches into the season really is a pretty damning place to be. What we know is this. As things stand Rangers are no further on from a year ago today. We may seem better on paper and have spent more hard cash – but the proof of the pudding is the results. And they are pretty much as they were. Pedro doesn't have a problem. Beating smellic would be an uplift we all need but the reality is under this manager, after bringing in some really good players, already we are struggling. Thanks Ped now move on. Said 4 weeks ago he will be away by Halloween, still think it. I think you are wrong. We do need to give the team time to gel and I believe we'll get it right. I think if we can get through to the Semi Final of the cup then we'll give ourselves a boost in confidence, which is all the team needs to help with he gelling process. An sort of result against them lot on Saturday would be another boost and from there, providing we aren't on the end of a hiding, I can also see us going from strength to strength. The fans need to be behind the team for 90 mins next Saturday and not get frustrated. It likely won't be pretty, but I think we have enough to trouble Celtic, as they aren't strong at the back and with the crosses we're putting into the box I can see us getting a goal or two, especially with Morelos in the form he's in. The team does need time, but I believe they are getting stronger by the week and I truly believe Partick will soon find that out on Tuesday where I think we will win comfortably. How much time does the team need? For the holdovers, Pedro has had 6 months! Even the new players have mostly had upwards of 2 months now (with a couple exceptions). At some point we need to stop making excuses that the team needs 'time to gel'. While that's certainly true to an extent any time you have the turnover that we've had, that excuse should have a very short shelf life. We're at the point where the players need to start producing. They're either good... or not! I'm with Joe - i think we are getting there, the problem for this site and some supporters is that it's taking time; well, that and Tav not being able to hold a defensive line when the CB's move up. Patrick were really up for it (as all the opposition are against Rangers) - should have had two sent off, don't know how many yellows they got as well - and good luck to them. But we'll hump them in the cup and i really think we'll give the bitter and twisted something to think about in the game after that. If it isn't going well come Christmas, then dump Ped, but until then, support the team and him. Give it a rest - it takes two teams to make a good game. Give the jags some credit they came out and had a go for most of the game. Football is a contest between two teams and i certainly don't expect the opposition to tole over because we are Rangers. I know from personal experience when you play against the Rangers you try twice as hard simply because they are the best you will ever play against. Give the present side a break last year we would have collapsed when Thistle went in front but not now. How are rangers the best thistle will play against? Like any team one or two players not up to speed they will struggle, ok we miss chances, but if you get an opposition who will battle against you the win will not come.Rangers still carry dead weight in the squad not a lot but enough to progress, the team is still gelling and i feel will get better, but the clock is ticking, hope i am wrong but if our manager does not get the tactics or team selection correct next week against Celtic i fear another beating, we all know who should now be dropped and others given a chance to prove themselves,i only hope the manager opens his eyes in time. Celtic are going to murder us. Stop with this crazy idea we're beating them, please. It's just going to leave us absolutely devestated. A draw is the honest best we can take. If they turn up it's going to be awful. Going "aye but PSG" is mentally ill. I fear for us. OK some realism needed amongst the support. The team that started against Thistle contained about 5 players who have never played at Firhill and by the 12th minute make that 6 when John came on to replace Wallace. On Saturday against Celtic we may well have a starting team of 7 players who are playing in their first Old Firm game EVER! New team. New Venues. New opposition. They need half a season just to get to grips with all this. In saying all that we absolutely still have defensive problems and the common denominator over the last few seasons is Foderingham/Tavernier/Wallace. Make of that what you will but for me one or two of them are just not good enough and it needs sorted. Full back is definitely a problem area in the side and I don't think John can defend. Graeme Shinnie would be a good signing to improve the full back problem. I think we need to go with three centre backs and two wing backs against Celtic . Bring Wilson in to play on the left side of central defence , with Tav and Lee flying forward and defending as necessary . Infact i reckon we should use this system on a regular basis , as we are often getting outnumbered in midfield by lesser teams like Thistle . Five , three ,two can become an attacking format or a defensive format depending on the opposition and on how the games progressing . The main thing at the weekend is to be tight at the back and get right fk'n into them ! It's time miller sat on the bench.he was truly terrible. No passes reaching any of our players. Windass was crap defence was crap .I could go on all night. I hope we beat celtic but I think they will run away with it.we simply are not the best . So, what will his line up be? If he goes 442 or 433 we'll get beat! However, if he goes 4231, we've a chance. Remember Hedgerow watched the1-1 game at the stade de nonce under Murty....but learned eff all from it , which in turn led to our biggest defeat from them on our turf but we are better equipt albeit false dawns still appear! We played ok last night but for 15 minutes at the start of the 2nd half.....atrocious, rank defending for both their goals. So my point is ....they will not hump us if Hedgerow gets his formation right a la sir Walter silversmith. So let me get this right, you're saying rangers should go ultra defensive at home against Celtic? 1 upfront and 2 deep defensive mids protecting the back 4? I John I think we should play 4-2-3-1 Every fuking game been saying it all season were not protecting our defence were covering our FB's who go camping in the wrong half every game!! I would drop Dorrans for Candeias me!! That green lot could only beat Partick 1-0 on 11 August at Firhill. They got away with a penalty claim from Partick late on could have been a draw why are we scared of them no fear! It's been shown time and again that the way to beat Celtic is to attack them. Rosenberg had them on the ropes for long periods and PSG destroyed them. If we play defensively and let them come at us they will tear us apart. We don't want to be negative. Jesus! That's all you are. Let's look at this season. We lost to Hibs on the back of a dreadful performance by referee. Celtic won by one goal at Firhill but Thistle had a stonewall penalty turned down in last minute.McLean of St Johnstone missed open goal at Parkhead when Saints were 1 up. Just imagine these 3 events had gone our way. Celtic would have 13 points and we would have 14. Small differences. A long way to go. But bigger picture is to finish 2nd this season but buy a couple in Jan and then next summer. Next season we win league. Oh and did you notice Aberdeens result today? If that had been us you would be screaming for managers head. But some people on here want to recruit him. Not sure if it is fact or not, but some media state we have actually spent more on our team this year than our neighbours. If so, then we should be getting a lot more confidence than what I am feeling. It just keeps coming back to Ped, he is just all bulls..., after the game on Friday, I think he is even losing his ability to talk crap, how the players can be enjoying working with him is mystery, please just leave Ped. We are marginally better than last year, because we invested in some better players - Alves, Jack, Dorrans, Moreles. The glaring problem however is the manager! Pedro is an absolute stonewall dud! Tactically naive and completely out of his depth in everything he does and says. Frankly a figure of ridicule. The cup defeat to Celtic, the humiliation at Ibrox, and the abomination that was Progres - all Caixhina's fault! Hearts bit the bullet with Cathro and we should have done the same with Caixhina. It is no surprise that we haven't managed three wins in a row under Caixhina. When you look at his win ratio throughout his managerial career - his win ratio at Ibrox to date is his best ever. This is Pedro's golden period - just think about that for a moment! Caixhina thinks he's doing okay - he's got no comprehension that it's not good enough. His wink to the camera as he left the field at Firhill was a giveaway. As long as he gets to play top manager for a wee while longer before he disappears back to the desert or the Mexican third division - then he's happy. Rangers right now have the basis of a decent side. 3/4 players short of challenging Celtic - but certainly we should be light years ahead of everyone else. Remember we spent decent money ion Pena and Herrera - two of the worst players ever to grace the famous blue jersey - money that could have secured the tried and tested such as Walker, Naismith. Even in Caixhina's inflated head he must have looked round at the bench on Friday night and wished he'd had a McKay to praise open the Thistle defense in the closing stages. Get rid of Caixhina - bring in an experienced manager - make us hard to beat against Celtic - and watch us coast to second this year - and maybe, just maybe - if we act now - challenge for top spot all the way to May. Too many unfit players lumbering around, suggests that training might be all theory. Too many touches to control and pass, suggests not enough ball work going on, probably all theory. PC's ego as a visionary is the problem, my way or no way. What was that wink to the cameras all about at the end of the match v Thistle? As if to say "What about that for a comeback then?" I'm afraid Celtic will be too fit for us in the 2nd half. There are some good reasons documented here I agree with quite a few especially the defending comments , we really need to get better discipline . I would like to see Windass improve his chasing back and defending sometimes that is his failure in attitude. The lad John seems able going forward but wrong position for the 2nd goal and poor reading, he may be another weakness that Roberts will expose aka Beerman ...The OF game will come and go I just hope we don't get gubbed, It would be great if we could get them on the back foot and frustrate the donkeys they have at the back. We need to beat the Sheep Shaggers and St Johnstone ....and of course the rest ...WATP ... Still not convinced Wes manages his 18 yard box enough either ??? I maybe the only one but for me the biggest disappointment so far is Bruno Alves. He was culpable at both goals on Friday. He looks like he thinks this is all very easy and he doesn't need to work too hard. I think the full backs are an question mark but I expected more from Alves. He should be managing the entire back 4 giving them clear direction minute by minute ( or moment by moment as PC would say). We should be getting much more out of this top professional. We are still lightweight in the middle. Jack and Dorran's cannot hold the entire team together by themselves. What Dorran's did on Tuesday (because he's a Blue Nose ) to score is exactly what every player needs to do for us to win every week. I'm not sure PC knows that. PC still worries me but he's what we have at the moment and we need to support him. It would help greatly if someone would tell him to talk less in his interviews as the longer he rambles on the less confident I feel. One of the biggest mistakes that the club have made was not insisting he has a member of his staff who knows Scottish football. Its clear to me he needs someone giving him clear advice on the attitude of the teams we play and the culture around the games. What was that ridiculous 'wink' to camera on Friday? He says he only needs two days to prepare for that lot coming over on Saturday...he didn't even watch their game against PSG. Really Pedro, if I was the CEO of RFC I'd be asking you if you know how serious Saturday is to the club and the fans. He's experience 2 games against them now, lets hope he knows a defeat on Saturday is not an option. We need to set up to get a point and some respect from this match. If PC had someone like Alex Rae ( for example ) telling him how serious this is I'd feel a little more confident but he doesn't. Does he know the significance of Brown and sorting him out I doubt it. We are making progress all be it very slow but Saturday we cannot lose...again. Over to you Mr Pedro.